It is shards of a broken, but enchanted mirror that fall to earth setting in motion this story of great friendship. When Hazel's best friend Jack has a piece of glass get stuck in his eye, he changes, as does everything else touched by the badness of the broken glass. He no longer is kind to Hazel and it devastates her. She knows boys get "thick and scratchy" as they get older and her mother tries to reassure her, but Hazel also knows Jack would never stop being her friend. When classmate Tyler confides in Hazel that he saw a witch take Jack away with her into the woods, Hazel begins her quest to rescue him. Hazel is a girl of fantasy and fairytales, and has a great imagination. But she finds that being in the woods is not the fairytale she imagined. Nothing makes sense there and danger is everywhere from those who would prefer her to stray from her task. Others in the forest tell her the White Witch only takes those who want to be taken. Does Jack even want to be rescued? Jack's life at home had not been good, but Hazel never doubts their friendship and knows she must try to bring him back to reality. Beautifully written story recommended for readers grades 5-9 who enjoy fairytales and magic. Careful readers will notice hints of other stories throughout the pages of this magical story, and chuckle. This story brings the reader right into the world of 10-year-old August Pullman. We learn what a normal kid "Auggie" is, despite his rare face disfigurement caused by a genetic irregularity. He's been homeschooled until now, due to the scheduling of his many surgeries, but his mother thinks it's time he enrolls in a private middle school by their home. Naturally, August is extremely worried about the impression his face will make. He is right to be worried, and the year begins with the other kids playing a game likened to the Cheese Touch (from the Diary of a Wimpy Kid books) where they avoid touching him or anything he's touched. As well, a "war" develops separating the kids who will befriend Auggie and those who won't. The story covers his entire fifth grade year, but also tells what is happening to his sister Olivia and new friend at school Jack, from their own perspectives. What we realize is that everyone has friend issues and some are caused by Auggie, but ultimately, each realizes their true feelings about him. This book is full of emotion and brought me to tears from the compassion found at Auggie's school where teachers attempt to teach kindness. I also laughed at the middle school jokes and antics. The A.R. level is 4.8 and is appropriate for readers in grades 3-6. Highly recommended. I listened to this as an audiobook and enjoyed hearing the different characters in different voices. Evan and Jessie are the best of friends until Evan finds out his younger sister is going to skip a grade and be in the same 4th grade class with him. 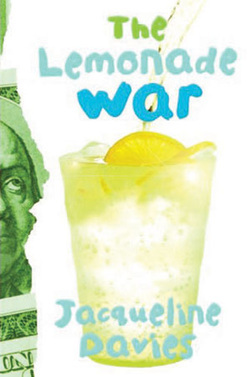 He doesn't acknowledge that this bothers him, but his attitude toward her is suddenly cool and leads to a misunderstanding that escalates into the "lemonade war". They make a bet to see who can raise the most money in the coming week by selling lemonade. Winner takes all. They each have strengths that can help them...Evan is good with people and Jessie is good with math. But, there are scrupulous activities happening behind the scenes and it is anyone's guess who might come up the winner. Each chapter begins with a definition of a sales term, and the story incorporates many tricks of salesmanship that might be useful to other entrepreneurial children. It also includes lots of math problems and ways to solve them. One aspect of the book that I really enjoyed was that the kids had a problem and managed to figure out how to solve it without an adult's help. This is written at an AR level of 4.1. and lots of fun. A problem introduced in this book leads to the second book "The Lemonade Crime". This is a magical story by the author of "The Boy in the Striped Pajamas". Noah Barleywater is eight years old and feels that he has nothing to show for it. He decides to run away to have great adventures. Leaving the edge of the forest, he passes through towns afraid that someone might discover that he has run away, especially after a newspaper prints a story about him stealing apples from a tree. But, by lunchtime, he has come upon a third town that intrigues him. Really, it's a tree that catches his attention and he can't seem to keep from staring at it. There is an odd building behind it, but the tree seems to block his view, no matter which way he turns. He meets a donkey and a dachshund who tell him about the town and the strange story of the tree - how the townspeople say branches will be stripped off in the night but quickly grow back in a matter of days. They encourage Noah to go inside the building, a toyshop. The shop seems alive to the boy. The puppets and toys inside seem different, and the old shop owner treats them like friends. During the course of an afternoon, Noah and the toymaker exchange delightful and sorrowful stories, and slowly the real reason why Noah is running away is revealed. A surprise ending will please fans of fairy tales. This book is suitable for readers in grades 2-4, although I would highly recommend listening to the audio book. The A. R. level is 5.6 making it more difficult to read for the intended audience, but the narrator is so entertaining that younger children will have no trouble listening to it. 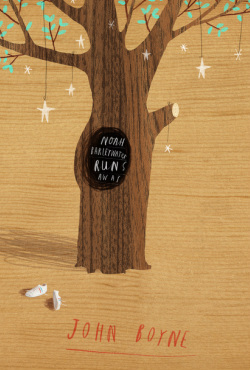 Although a very sweet story, there are themes of grief and regret that slowly unfold. Told in three parts, this book of poems tells the story over the course of the year, 1975, from the perspective of 10-year-old Ha. Her father is missing-in-action during the Vietnam War and her mother has decided to try to escape the country before Saigon falls to the Communists. Leaving on a navy ship with hundreds of others also trying to escape, Ha, (with her mother and three brothers), is rescued by an American ship and taken to a tent city in Guam where they will ultimately decide where they want to go next. Ha's mother chooses America when she hears her sons might earn scholarships to college. They arrive in Florida, and stay in another tent city where they must have a sponsor take responsibility for them before they can leave. To become more eligible, Ha's mother changes their religion to Christian on their application. A man from Alabama comes looking for a boy he can train as a mechanic. He chooses Brother Quang who possesses some engineering education, and ends up with the entire family of five! The final portion of the book covers the family's time in Alabama - learning English, going to school, coming to terms with the fact their country doesn't exist anymore and are likely not to ever see their father again. 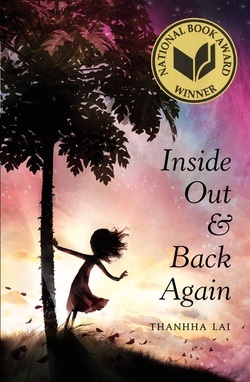 This book won a 2012 Newbery Honor Award and was a National Book Award Winner. Suitable for readers in grades 6-8 who enjoy historical fiction and stories about children whose lives are greatly altered by war. This is easy to read and includes a message about bullying. This book will surely grab a lot of interest due to its timely topic about the Mayan calendar that ends in 2012. Many people think it signals the end of the world. 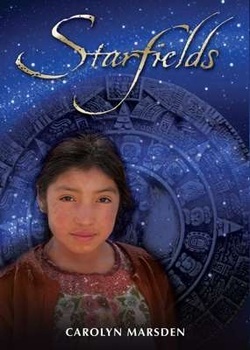 The book centers around a nine-year-old Mayan girl named Rosalba, and her new friend from Mexico City named Alicia. Alicia is in a rural part of Mexico where the Mayans have a village, along with her father and his team of scientists who are studying frogs. Rosalba is told not to trust the "ladinos", but she disobeys her father and secretly meets with Alicia in the forest. It is from Alicia that Rosalba hears the myth about the Mayan calendar, but she has never heard it before. Since she weaves the traditional stories onto blouses to sell in the market, she should know it. When she asks her mother and other villagers about the story, they are not familiar with it either. If their ancestors told this story, then it has somehow been lost over the ages. When bulldozers start tearing down everything in their path to build a road, the scientists discover that frogs are dying. The Mayans have mixed opinions about the building of the road and Alicia challenges Rosalba to do something to stop the destruction. The story alternates with another storyline involving a young shaman from 600 A.D. His eyes were bound at birth so he could not see. A man provides mushrooms and other hallucinagins to help him see visions and predict the future. In one vision, the shaman and Rosalba meet, which helps lead to her decision that goes against the traditional Mayan ways. This is an environmental story appropriate for readers in grades 4-6. Those who enjoyed the book "Hoot" would find this has a similar message. It will also appeal to those who enjoy multicultural stories since the reader is given a glimpse into the traditional Mayan culture. I found it thought-provoking and especially liked Alicia's explanation about a sun burst that happens on a regular basis as the Earth approaches the center of the universe. When this happens, all life on the planet is killed and begins again. Rosalba recognizes this as the Noah story. It seemed a plausible explanation as to how the Mayans might have calculated the next time this would happen to upset life on Earth. This is excellent to listen to on audio as well since the accents of the two girls are depicted and difficult Spanish words are pronounced. This easy-to-read story is told over the span of two days. Sasha Zaichak is a ten-year-old boy growing up in the Soviet Union under Stalin's rule. He is about to become a Young Pioneer and is extremely excited to learn that his father, a hero working for Soviet State Security, will be tying the red scarves of the children at his school the next day that will recognize this important step in becoming a Communist. Sasha is completely devoted to the coming Communism and writes a letter to Stalin promising his stength and vigilence to the cause. But the next day, nothing goes as he imagined and to top it off, in the excitement of carrying the banner for the Young Pioneer parade and ceremony, he accidently breaks the nose off the Stalin statue in the school hallway. The consequences for mutilating Soviet property is severe. Will Sasha show true Communist character as he has vowed, or have circumstances changed so much that he chooses another path? The writing is extremely clever and succinct in this story, it is easy to see why it was awarded a 2012 Newery Honor Award. Seeing communism through Sasha's innocent eyes and his justification of food shortages and communal living is precious. His guilt for his and his fathers' comparitively better room conditions is heartbreaking. And the amount of misinformation to which he has already been fed about the wonderful world of communism and the "hard lives of children in capitalist countries" is eye-opening. Plenty of black and white illustrations fill the pages, adding a sense of mood to the story, emphasizing the brutal weather and harsh living conditions. My take away from the story is that under Stalin's rule, everyone is looking out only for himself in an effort to remain alive, and no one can be trusted. 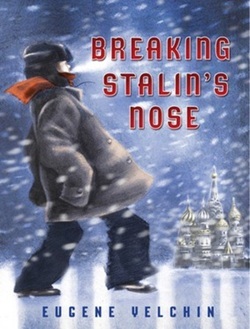 Suitable for grades 4-6 and older readers interested in a look from a child's perspective into the Soviet Union under Stalin's leadership. This would also be great for discussion; there is a lot to talk about including the cliff-hanger ending. A similarly themed book, though aimed at a slightly higher audience, is "Hitler Youth", which looks at the part youth played under Hitler's rule. Christian was introduced to the world in an emotional YouTube video and instantly touched the hearts of many people like me, who love animals and know they also feel love and attachment as equally strong for us. The back story of the video is described in this book, as two friends, Ace and John, searching for holiday gifts in London, discover a lion cub for sale in a department store. They take him home and exercise him in the garden of a nearby church, but quickly realize their pet needs more care than they can give him. They begin looking for alternate living options for the young lion, knowing that zoos and circuses will not be considered. Running an antique store, luck was on their side when actors from the movie "Born Free" visited. They put the men in touch with a man named George Adamson, a man portrayed in the movie who worked with lions in real life. 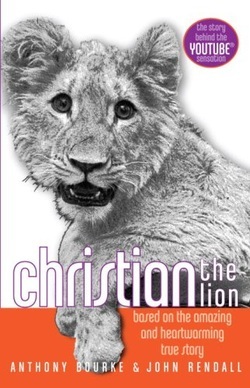 He was preparing to release a group of lions in Kenya and hoped that Christian could be released with them. Christian first needed to learn skills to prepare him for his new life, so Ace and John moved Christian to a temporary home where he met two other lions being released. They all make the trip to Kenya together when Christian is finally released into the wild. The famous video shows their reunion one year later. This book isn't written for literary merit, but is a nice, easy to read story for kids ages 8 and up who want to know more about the video. It includes photographs of Christian as a playful and loving companion. Additional information is provided at the end of the book about Kenya and other wild animals living there. Another similar book that might be of interest is "Born Free", which is mentioned in this book. 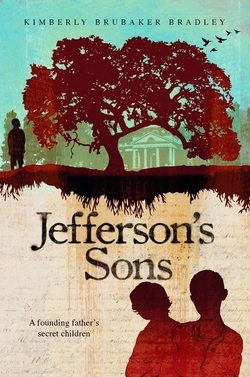 This historical fiction story centers around the lives of the slaves working on the mountaintop at Thomas Jefferson's Monticello in Virginia. Jefferson fathered six children by his wife Martha between 1772 and 1782. She died after her final child, and only two of the children lived to adulthood, both girls. Jefferson never remarried, but it is believed that he fathered seven more children between 1790 and 1808 with his slave Sally, who was his wife's half-sister. The story focuses on these four children that survived into adulthood, three boys and one girl. Sally always told her children who they were and that they had been promised freedom once they turned 21 years old, but with Jefferson's excessive spending habits and surmounting debts, they are never confident that this will happen or that they won't be sold should he die. The two oldest children, Beverly and Harriet are told to watch the mannerisms of Jefferson's white grandchildren so they might attempt to "pass" as whites when they become free. Beverly learns to play the violin like his father, and both learn to read. The third child, James Madison or "Maddy" knows he is too dark to ever attempt to pass, but he also learns to play violin and read. It is believed that Jefferson's granddaughter, Ellen, is the one who taught Maddy to read, and he then taught his siblings. The youngest child, Thomas Eston, known as "Eston" to his family, was said to have a remarkable resemblence to Jefferson and to play the violin like a prodigy. As slaves, the boys are all apprenticed to learn carpentry. While they realize they live better than the slaves who work the land, they are resentful that Jefferson does not acknowledge or treat them as he does his white children and grandchildren. I thought that the author did a terrific job in creating a story around the known facts that have documentation, and explaining through the characters how Jefferson justified the conflict between his public belief in freedom for all people while maintaining slaves. I began to understand how his intentional lack of acknowlegement might have allowed the children, once they "passed", to eventually have a life where they were never known to have been slaves. Once this happened, though, they could never admit that Thomas Jefferson was their father, or they would become known as freed slaves. A family tree is included in the front pages, and notes are included at the back. Highly recommended for readers in grades 5 and up who enjoy historical fiction, presidential history, slave life, and family secrets. This graphic novel shares the stories of three adventurers in the 1800's who circumnavigated the globe in three different ways. 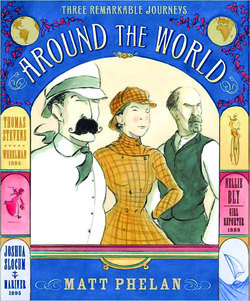 Inspired by Jules Verne's novelAround the World in 80 Days, Thomas Stevens, Nellie Bly, and Joshua Slocum each travel independently completing journeys that received attention from a public that craved to hear more. Thomas Stevens made the journey on a high-wheel bicycle in1884. Nelly Bly was a reporter who raced against time in 1889 to beat the previous record held by Phileas Fogg's 80 days. And Joshua Slocum sailed alone on his boat, the Spray,in 1895. Each was successful despite the specific hardships and delays. Readers will find the tales fascinating. 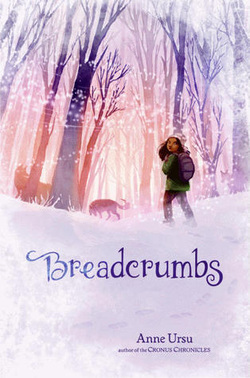 Low on text and high on emotion, this is recommended for children in grades 4-8 who enjoy people stories and their adventures, and wonder what would drive a person to undertake such a feat. Because mostly, this is about the personal decisions of each to undertake their journey, and covers only this portion, as opposed to a biography of their entire lives. The artwork uses subtle tones and will appeal to reluctant readers who enjoy the graphic format. Maps show the routes taken by each traveler. 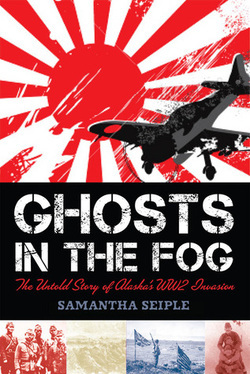 This nonfiction book chronicles the time beginning on June 7, 1942 when Japan invaded Alaska. Brought to life through photographs, maps, and first-hand accounts from both sides of the war, it tells the story of what we now call the Forgotten War, the attack by the Japanese on the Aleutian Islands of Alaska following the Pearl Harbor attack. The U.S. denied that these islands were attacked saying, "none of our inhabited islands or rocks are troubled with uninvited visitors up to this time." The natives living there, which included the Aleut and Inuit Indians, might have to disagree. The weather teams set up to provide weather reports for the U.S. military, might also have to disagree. These peope became POWs and were kept in deplorable conditions in Japan. The Indians relocated to camps on mainland Alaska would have to disagree as well. It was interesting to note that while Japan reported the successful invasion to its people, the U.S. denied it. Likewise, the U.S. reported its victory at Midway, while Japan denied that. Code-breaking efforts, war strategy and miscalculations by those in command, Eskimo life, survival on the foggy, cold, nearly unihabitable Aleutian Islands, and the role of the weathermen in the war are all interwoven into this interesting piece of history that most Americans were never aware even happened, because according to the U.S. military, they did not want to induce panic on the population. This would be interesting to those readers who have an interest in history, World War II, or war strategy. Since it has a very high AR level, it would make a good choice for those younger children who need something more difficult to read, but adult readers will also find this fascinating. Extensive source notes are provided at the end. Part of the Binky adventures, in which Binky the cat is dismayed when a foster kitten named Gracie is brought into the house. Told in graphic novel format, the unique thing about this series is that Binky is a certified space cat. The adventures take place in the space station (house) which he must protect from the aliens (bugs). This is written in one line sentences with the emotion coming from the sepia toned illustrations. As in real life, Binky's feelings come through with the position of his ears. Gracie turns out to be a surprise for Binky when she reveals her true identity. Now Binky isn't sure he wants her to leave. The vocabulary is a bit challenging but the continual illustrations should encourage young readers in grades 2-4 who enjoy animal stories or graphic novels. Eleven-year-old Jeremy Bender wants to prove to his father that he is responsible in order to take the prized Cris-Craft boat out alone. Instead, he and his friend Slater accidentally spill Orange soda, and then green spray paint, all over the carburetor while attempting to tighten the belts. They don’t have enough money between them to replace it, and there is no way Jeremy is going to confess to his father. The boys are determined to find a way to raise enough money to replace the engine. When they hear about a model sailboat tournament with a $500 prize, the boys are convinced they can win it, especially since they’d be competing against the girls in the Cupcake Cadets. 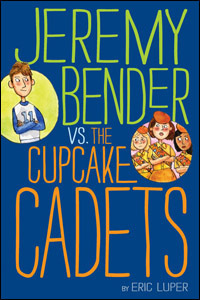 But to enter the race, you must be a Cupcake Cadet, have earned three badges and sold the required number of cupcakes. The boys think it will be a “cupcake walk” and agree to dress like girls to infiltrate the club. But selling cupcakes isn’t as easy as they thought it would be. Neither is earning badges. They lost the Pie-Making badge when their burnt apple pie made the troop sick. And the girls weren’t the ones to score a goal for the opposing team in field hockey, which cost them the Sports Star Calliber Badge. Their attempt to earn the Wilderness Survival Caliber Badge was a disaster from pitching the tent to finding out their tent-mate Margaret has won the Windjammer Whirl three years in-a-row and is working on her third prototype for this year’s vessel. They hadn’t even begun to build theirs yet. But worse than that is that they’ve been found out! Now how will they earn enough money to repair Jeremy's father's boat? This humorous story is recommended for readers in grades 3-6. Girls will appreciate that they perform better than boys in certain activities, while boys will get a lesson in what it's like to be a girl.